LabVIEW bundled with an Arduino. Such a great combination of a low cost and flexible electronic interface for sensors with LabVIEW the industry standard in measurement and test programming software. 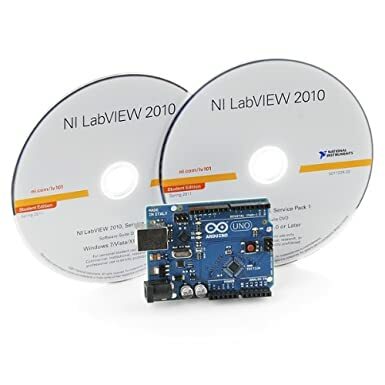 Anyone can purchase the Arduino microcontroller and be up and running LabVIEW within minutes. Web searches for the keywords "LabVIEW" have slowly dropped over the years since their peak at 2004. However the keyword "Arduino" has shot up like a rocket in the last two years. LabVIEW can be free as long as you use the evaluation level given to anyone wanting to try the software out for free. National Instruments is very generous with this feature and allow students extra benefits. With the small investment in an Arduino Uno, you can have a full instrument measurement package to innovate with. The search keywords "LabVIEW Arduino" had a huge breakout in early 2011 when the LIFA patch was introduced. It's been on a steady rise ever since. Popularity is growing each year. Thanks to your post, you help me a lot!